Congrats to Nathan Phillips and his family. 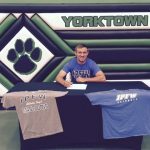 Nathan signed his letter of intent to play baseball next year at IPFW. We wish him luck next year!